So you are thinking of getting an air compressor? You are probably wondering whether it’s worth the cost of purchasing one. Most probably you already have a couple of ideas as to why you need the air compressor in the first place, but what else might you use it for? What can I use an air compressor for? As you can see, air compressors are pretty useful bits of DIY kit to have around the home as well as the workshop, but how does one go about choosing the best air compressor for oneself, given that there are so many ‘shapes and sizes’ out there? Well hopefully we are going to answer that question for you! In this article, we first look at the small set of characteristics that truly differentiate air compressors from one another that you should be aware of when preparing to purchase one, and then we go on to compare the different specifications of popular air compressors that are available on the US market today. Once you have narrowed down the sort of specifications you would like to have on your new air compressor, then don’t forget to check out our individual reviews of each air compressor by clicking on the names of air compressors in the tables below or through the ‘portable’ or ‘stationary’ air compressor categories near the top of the page. How do I choose the right air compressor for me? There are four main parameters that are good to know about when choosing an air compressor, however, you really only need to be aware of the first two characteristics (below) to choose the correct air compressor for you. The most critical parameter to understand is the measure of airflow or air volume delivered by a compressor given in cubic feet per minute – or ‘cfm‘ – (‘cfm’ is sometimes mistakenly written as ‘scfm’ (standard cubic feet per minute) which is actually something slightly different. But for all intents and purposes, unless it is clearly meant to be ‘scfm’, you can assume that what was really meant was ‘cfm’). The second most important parameter to understand is the measure of air pressure delivered by the air compressor given in pounds per square inch – or ‘psi‘. This is the measure of the volume of the tank that holds the compressed air. Air compressors sometimes come with more than one tank connected together but the number of tanks is actually irrelevant since the total volume is what counts. This is the measure of the power of the compressor motor. Essentially, the higher the horsepower, the faster the compressed air tank is refilled. Now that we are all up to speed…. 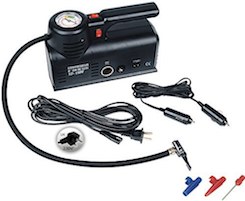 Different air compressor-related activites require different types of air tools. Each air tool is rated for the air volume (cfm) that it consumes when operating and the air pressure (psi) that it requires in order to function properly (these cfm and psi values are usually provided by the air tool manufacturer although sometimes it is ‘common’ knowledge as to the pressure the air tool should be operated at and it is sometimes omitted). 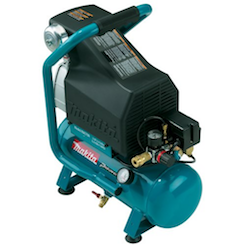 So ultimately, what it comes down to is determining which air tools you want the compressor to be able to operate, and once you know that, then choosing the compressor is simply a matter of getting one that can produce the airflow and air pressure needed. In fact, it is even simpler than that! 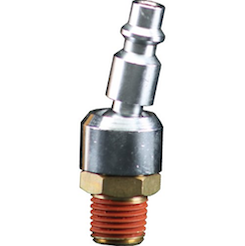 Effectively, all air tools will operate within either of TWO ranges of air pressures, namely the lower range of approximately 40 psi and an upper range centered around 90 psi. 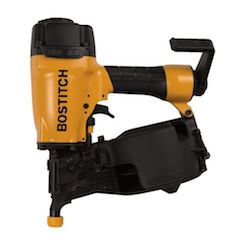 For example, spray painting guns operate within the lower range of air pressures whereas air nailers operate within the higher pressure range due to the force required to drive nails through a workpiece. Different types of air tools consume air in different ways. 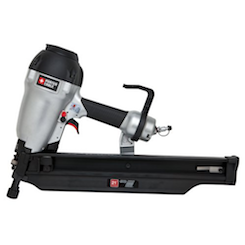 Some require continuous airflow for an extended period of time as with air sanders, while other types of air tools are active intermittently for short bursts, for example, air nail guns. This has important implications for air tool manufacturer cfm ratings, since in order to provide a realistic air volume consumption for the tool, they have to make certain assumptions on how active the tool will be in the hands of the owner, and this is usually provided in the form of the ‘average air consumption’ which is what the cfm rating that you normally see actually refers to. 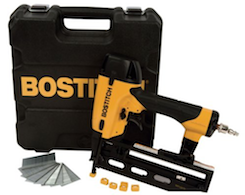 Air tool manufacturers make different assumptions for different types of air tools. 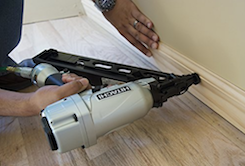 So for example, the average air consumption for air nailers is usually calculated on the basis that 30 nails are fired from the air tool within the space of one minute. 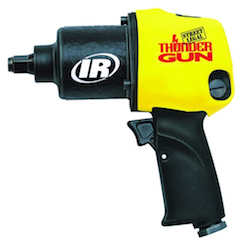 In the case of air impact wrenches, manufacturers usually assume that the wrench will be active and consuming air for 20-25% of the time, or thinking of it another way, it will be used in short bursts for a total of 12-15 seconds within any one minute period. Consequently, when looking to choose an air compressor for a particular air tool, in order to cover higher than expected potential activity levels of that air tool, a good rule of thumb is to always increase the rated cfm value provided by the manufacturer by 20-50% to ensure the chosen compressor can provide sufficient airflow for higher than expected levels of tool use. On the other hand, if you are sure that you will use an air tool at a lower activity level than the average consumption for that air tool, then you can get away with an air compressor that has a lower cfm rating. To make things easier, air tool calculators have been incorporated on individual air tool pages on this website allowing you to estimate your likely tool usage levels and to derive a more accurate picture of the air volume required from your future air compressor. And now for the compressor…. The vast majority of air compressors can generate pressures in excess of the upper 90 psi range so we usually don’t have to worry about whether the compressor is able to produce the desired pressure. However, the airflow or cfm that a compressor can sustainably produce will be different at different air pressures. For example, compressor X producing air at 90 psi, might be rated to sustain production of 2 cfm of air volume, while at 40 psi it might be designed to sustain 3 cfm of airflow. Consequently, manufacturers generally provide two cfm ratings for their compressors, one at 40 psi and the other at 90 psi. Therefore all we have to do to choose the right air compressor is simply identify which pressure range the air tool normally functions at, and then choose an air compressor whose rated airflow at that pressure range is equal to or exceeds the airflow consumed by the air tool in question. For example, an air sprayer might consume 4 cfm at 40 psi, so a compressor with a rating equal to or greater than 4 cfm at the 40 psi pressure range should function properly with this particular air spray gun. It should be noted that although compressors can run air tools that consume more air volume than the compressor is designed to provide, it will either be for too short a period for the tool to be used effectively before the air tank runs out, or the compressor will run longer than it was designed for, potentially over-working the motor, causing it to heat up and to fail prematurely. 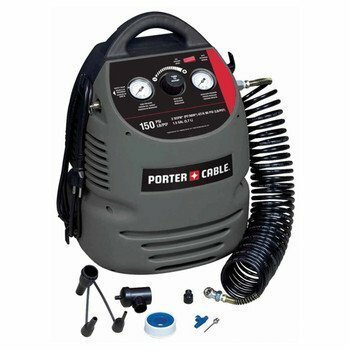 Portable air compressors are those air compressor units that have been designed to be relatively easy to move around the home or workshop. Some portable machines may still be quite heavy in which case they are often designed with integrated wheels that make the unit easier to move around. Due to their compact designs and smaller air tanks, they tend to have lower air flow (cfm) ratings than stationary machines. **na : not available – the information has not been supplied by the manufacturer. Stationary air compressors are those air compressor units that are expected to be permanently installed in a single location in the garage or workshop. As a consequence, they can have much larger air tanks and larger compressor motors than portable machines which usually means that they can provide much higher airflow or cfm ratings.